6.3 MILES AWAY TO A DAY ON THE SLOPES! Warm and cozy...this charming and very clean home is a delightful escape from the 'tyranny of the urgent.' 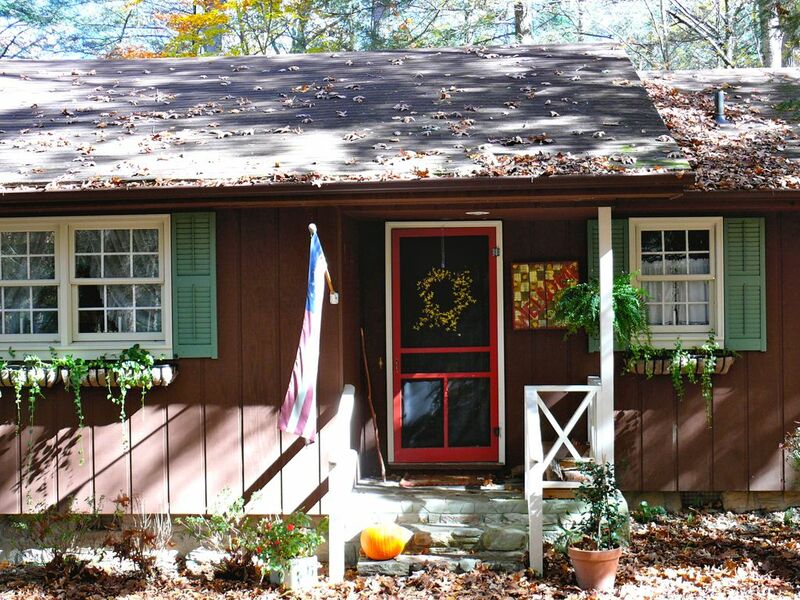 Nestled in the Blue Ridge Mountains, Peaceful Creek Cottage is situated by a roaring creek that promises to lull you to sleep and whisk your stress away. Our home is comfortable and inviting. We think you will be completely satisfied with the decor. We have decorated it with special touches that create a homey and lovely environment. We have two bedrooms-both have a queen size bed. In addition, our loft has two twin beds...a special favorite for children. Adults have slept there (including us! ), but the loft is not quite tall enough for a full size adult to stand. It is perfect, however, for children and teenagers. And agile adults! Hardwood floors are through out the house. There is one full bath and a bathroom in the master bedroom. This home is located behind Twin Brook Resort, and is in a neighborhood that is almost exclusively seasonal homes. It is very, very quiet and peaceful. You can see all of the amenities that are included to assure this home will provide every thing that you could possibly need. We have included board games, a wonderful DVD library, firewood for a cozy evening by the fire...and even marshmallow roasters! We understand that some need to smoke--we just ask that you puff outside and not inside. We also love and appreciate pets. And so they are welcome, with a non-refundable pet fee. We do ask that you would take them with you when you are leaving the house, or that you would crate them. We know that you will understand. We provide all the information you would need for nearby activities including all of the hiking trails and waterfalls. You will be located only minutes away from such popular attractions as the Biltmore House and Gardens, Blue Ridge Parkway, Cherokee Indian Reservation, numerous championship golf courses, horseback riding, whitewater rafting...and much more. Are you an antique lover? You will be able to shop to your heart's content! Take a ride on the Great Smokey Mountain Railroad and visit the National Park. View the elk at Cataloochee Valley or ski there during the winter. We really do have excellent dining in Maggie Valley, Waynesville and nearby Asheville. You will not be disappointed in the cuisine. And Dolly Parton is our 'next door neighbor!' Dollywood is very conveniently located to Maggie Valley. Come for a few days...we feel sure you will want to return. A day in the barn...I manage this property for my mother and I lived in the cabin for five years myself. It is a wonderful place and I always enjoy going back there. We love sharing it with our guests that appreciate it as we do. Family in the area--located in a beautiful part of the mountains. It is genuinely one of the most relaxing and peaceful places that we have ever owned. Full sized fridge with ice maker. Drip filter-we keep filters for guests. Fully stocked with everything you need for cooking. Our screened back porch that overlooks the roaring stream is our greatest delight. Complete with glider, rocking chairs and a swing...you will have many hours of peaceful pleasure and conversation. This feels like our home away from home. This was our 5th visit. Angela is always very responsive. The place is always clean and comfy. I love the view and sound of the Creek just out the back door. The house is easy to get to and convenient to everything. We will definitely be back. Cozy cabin convenient to Cataloochee! The cabin was perfect for a weekend getaway! Well stocked with all the essentials and convenient to town and Cataloochee Ski area. Loved the screened porch overlooking the creek. The owner was so helpful and easy to work with. We will be back! This was the best cabin we have stayed in! My two daughters loved the upstairs beds, our Golden Retriever dog loved the backyard and running up and down the outside stairs, and my husband and I loved everything about the cabin! Very clean and cozy! There was nothing we needed that we couldn’t find there. The beds were also super comfy! We will definitely come back! Cozy, clean cabin that was perfect for our family. This cabin is perfect for a get away. It has a Creek right behind it and a beautiful porch to sit on a listen to the creek. It is nestled in a beautiful area as well. We had a wonderful time spending Christmas here as a family. So relaxing- peaceful, quiet and private. The creek is awesome with the screened in porch. It was the perfect getaway to hang out and relax with our adult kids. Cozy, clean and comfortable and had everything you needed. Would love to come back again! !